Our Tellfresh Pastry Storer is flat-out great! 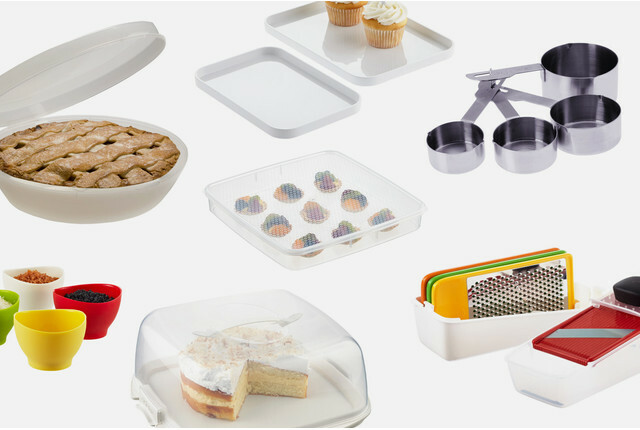 Its size and shape makes it ideal for storing everything from phyllo dough and brownies to pizza. The airtight lid ensures food stays fresh. Designed for use with our Tellfresh Food Storage containers, our ingenious Tellfresh Tags (sold separately) clip onto the side of the container to take the guesswork out of what's inside and how long it's been there. Tellfresh Pastry Storer is rated 5.0 out of 5 by 9. Rated 5 out of 5 by Scrapngirl from Perfect! We use these for our pizza business. They store our sheeted dough perfectly. We use them 5-6 days a week and after 4+ years I've just now had to buy more. I love these! Rated 5 out of 5 by RinaRivera from Perfect for guava pastries or mini Napoleons It is the perfect size for a set of 16 pastries made with a box of Pepperidge Farms' Puff Pastry Sheets. I follow the recipe for Mini Strawberry Napoleons that comes in the box, but use guava paste or "dulce de leche" as the spread. Sorry, I can't say how long this container would keep the pastries fresh because the pastries are gone in a flash. However, the container closes tight and is very convenient for taking your pastries along to parties. Easy to clean as well. Rated 5 out of 5 by zer0girl84 from Great product! I have been looking for a shallow food storing product like this for years! The only thing that would make it better is if it were longer and wider. I love bringing cookies around for the holidays, but many of my cookies can't be stacked on top of one another due to caramel, frosting, etc. Please make them in a bigger size!! Rated 5 out of 5 by PamO from Perfect for sugar cookies I have been looking for flat, airtight storage containers for some time, these are great! They fit about 9 of my large sugar cookies, and a dozen small ones. I wish it was available in an even bigger size. Rated 5 out of 5 by imagen from Perfect containers I went to The Container Store to find the flattest container I could to store, dry and deliver royal iced cookies that I didn't want to stack and to take fondant cupcake toppers. These did the job perfectly. Bought 10 of them and I'm ready to buy them again for the people who saw them and liked them. I also like the fact that they're not made in China and they are BPA free. There are no compartments or sections on the inside. What are the inside dimensions of this container? Thanks! It's Turkey Time! Kitchen Tools & Must-Haves Before You Get Cooking! We know you're beginning to make your shopping list for your yummy Thanksgiving feast. So we thought we'd serve up our favorite kitchen must-haves that will help keep you organized and sane. From meal prep, to leftovers - you'll be thankful you have these little organization helpers over the holiday!